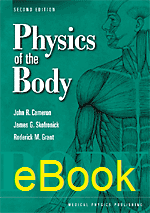 This edition of a popular text contains information on the relationship between physics and the workings of the body. Material on forces in dentistry has been added, and an entire chapter is devoted to the physics of the ear and hearing, with more detail on the function of the inner ear. Many illustrations have also been added. This book is intended primarily for students who plan to make a career in some field of medicine. The authors rely on basic physics principles to promote an understanding of the function of the various organ systems of the body such as the eyes, ears, lungs, and heart. Although it was written primarily as a text for students who have some knowledge of elementary physics, it will be interesting and understandable to any person who is curious about how his/her body works. The mathematics is at the algebra level. Several problems have been added to this edition along with answers to all the problems.